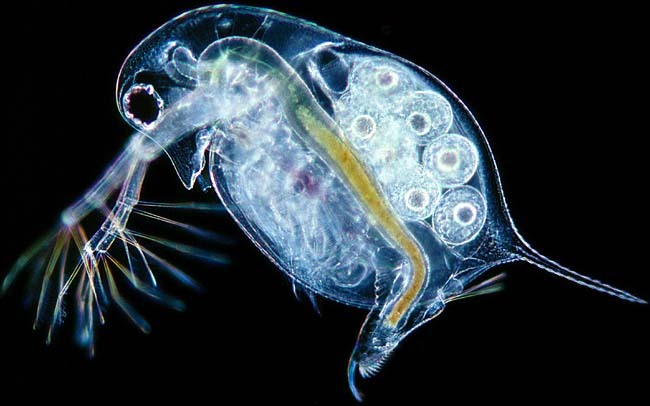 Water-flea anatomy - by Wim van Egmond, The Netherlands This is a mouse-over image of Daphnia longispina, a common water-flea. Use the underlying image to examine its main anatomical features! Water-fleas are easy to find. Most ponds will provide enough of these small crustaceans. They are ideal subjects for study under the microscope. You can examine them swimming under a low power stereo-microscope. When observed with stronger magnification it is best to use a deep slide. You can add dots of vaseline to the corners of the coverslip to prevent the water-flea being damaged. It is wonderful to see the heart beating and the blood flowing! The body of a water flea is protected by a shell-like carapace. This looks like two valves but consists of one piece. It covers the five pairs of leaf-like legs. These are used to filter food but also bear gills. At the end of the body (abdomen) we find the post abdomen with a paired claw (furca). It is used to remove unwanted particles between the carapace. Published in the January 2002 edition of Micscape Magazine.